Shortly after BrooklynSpeaks asked Gov. David Paterson to address multiple aspects of the stalled Atlantic Yards project, Brooklyn Borough President Marty Markowitz and Assemblymember Jim Brennan both sent letters requesting developer Forest City Ratner and the Empire State Development Corporation (ESDC) to respond. There are distinct differences between the two letters, however, with Markowitz's tone hedged, friendly, and conciliatory, and Brennan's approach more pointed, accusing the developer of having created blight. Both are posted on the BrooklynSpeaks web site. 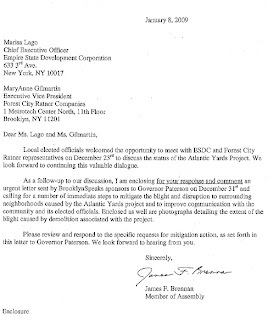 Brennan's letter, addressed to ESDC CEO Marisa Lago and FCR Executive VP MaryAnne Gilmartin, is more formal, essentially endorsing the elements of the BrooklynSpeaks letter, which, among other things, asked that further street closures and demolitions be halted, that viable vacant buildings be repurposed, that the Carlton Avenue Bridge be returned to service, and that interim public open space be created. 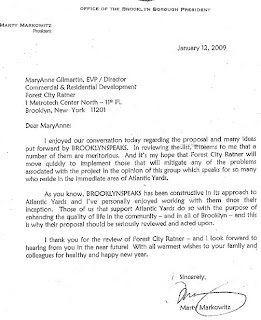 As a follow-up to our discussion, I am enclosing for your response and comment an urgent letter sent by BrooklynSpeaks sponsors to Governor Paterson on December 31st and calling for a number of immediate steps to mitigate the blight and disruption to surrounding neighborhoods caused by the Atlantic Yards project and to improve communication with the community and its elected officials. Enclosed as well are photographs detailing the extent of the blight caused by demolition associated with the project. I haven't seen the photos he sent, but the slideshow above, with photos by Tracy Collins, probably serves as a representative example. Markowitz: "a number are... meritorious"
I enjoyed our conversation today regarding the proposal and many ideas put forward by BrooklynSpeaks. In reviewing the list, it seems to me that a number of them are meritorious. And it's my hope that Forest City Ratner will move quickly to implement those that will mitigate any of the problems associated with the project in the opinion of this group which speaks for so many who reside in the immediate area of Atlantic Yards. Markowitz did not specify which ones are meritorious. And his third sentence, which essentially endorses the "opinion of this group," could be read to suggest that all are meritorious. Perhaps Markowitz thinks it's practical and possible--and good p.r.--to "create interim public open space as play areas or community gardens," as BrooklynSpeaks requested. But does he really think the developer would "[m]ake publicly available current expected and worst-case construction timelines" or "[r]eturn the Carlton Avenue Bridge to service"? As to whether BrooklynSpeaks "speaks for so many," well, it certainly speaks for some, including most of the elected officials who represent the area around the project. But the Council of Brooklyn Neighborhoods (CBN) and Develop Don't Destroy Brooklyn (DDDB), both of which have gone to court to challenge the project, probably speak for more. DDDB has kept the pressure on, pointing to the lack of transparency on the part of the developer and the state. And CBN has called for an audit of public monies spent. They, apparently, don't think that asking nicely will get them anywhere.